This week 100 of the girls were seen in traditional Muslim garb, chanting “Praise be to Allah, the lord of the world.” However, what’s not been reported widely is that the girls are Christian, speak English – and are being forced by their captors to become Muslim. That is utterly contrary to what the Koran teaches, asserts Dr. Sayyid Syeed, National Director of the Islamic Society of North America, an umbrella organization of 2,500 mosques. Virtually all were built in the last 40 years. Yet that is exactly what Boko Haram did after capturing the school of girls – forcing them to be Muslims. Secondly, their school was destroyed. Again, that is a familiar pattern. A year ago the world was horrified to learn of a 15-year-old in Pakistan, Malala Yousafzai, who was shot in her head by a Taliban soldier on October 9, 2012 for daring to go to school and for speaking about the importance of educating girls. Her father was the school’s principal. Two other girls on the bus with Malala were also shot, but Malala was the special target because she had become famous as a speaker on behalf of educating girls from age 11. Schools for girls were being blown up or burned by the Taliban in the Swat Valley where they lived. A BBC correspondent called her father and asked for a female teacher or a girl who would write a dairy about what it was like to live with the Taliban threat. Her first diary entry was published in 2009, at age 11. Under the headline, “I AM AFRAID,” she wrote, “I had a terrible dream last night filled with military helicopters and Taliban.” She was thrilled to see her words on a website. On the other hand, the Taliban set a deadline. Girls had to stop going to school, or suffer grim consequences. At the time 50,000 girls were in Swat schools. In her father’s school the number of girls quickly shrank from 27 to 10, as many moved to safer areas of Pakistan. A week later, her school closed too. Her family moved to Islamabad. A Taliban leader said in an interview, “Islam does not allow democracy or elections.” Or schools. 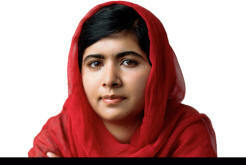 Her book, “I am Malala” is must reading.